The barricades that for more than two years kept people from walking in the tree planters where the Toomer’s Oaks once stood were removed for good on Monday by Auburn University Landscape Services. Just because. The War Eagle Reader was told that a request to remove the barricades was possibly made by an Auburn University Board of Trustees member who deemed them “unsightly” during the Board’s recent meeting on campus. Booth also suggested aesthetic concerns as part of the decision to remove the barricades. “They were kind of unsightly sitting there on the corner anyway,” he said. Booth believes the sign advising that the corner remains under video surveillance will be enough to deter souvenir seekers from picking the rhizomic shoots growing through the mulch in the planter closest to Magnolia Ave., which are being harvested for official Auburn Oaks mementos. After they put in place, the barricades were occasionally decorated with messages by Auburn fans, such as a “Wanted” poster for Toomer’s Oak poisoner Harvey Updyke, “that mean Alabama fan” who according to one young girl was “meaner than anyone in the world.” But this was our favorite. Photo: City of Auburn webcam. 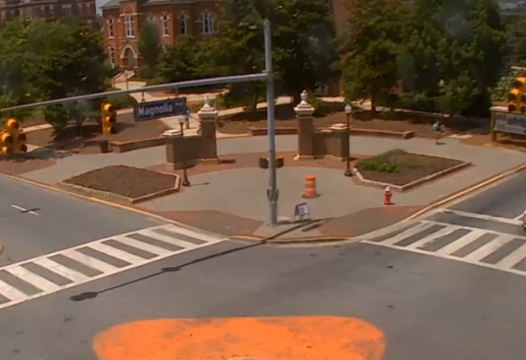 Related: Toomer’s Oak replica inside Auburn Art nearing completion.